Having watched the film, Ezzah Mahmud got so excited she wrote a nice review for us! I’ve been anticipating this film after watching the credits roll for ‘The Raid: Redemption’, the first film. I was visually and psychologically moved by the brutality of the film, as well as the charming gaze of Iko Uwais, an Indonesian heartthrob who took the lead role in the film. In ‘The Raid 2’, the plot continues, giving us the story that happened after Rama (Iko Uwais) got out from the building filled with gangsters in ‘The Raid’. After that incident, Rama went to meet a police insider recommended by his brother. He then told Rama that what he faced earlier were just some anchovies in the sea. What they need to do now is hunt the sharks, the big boss, the ‘Abang Long’ of all this messed up and corrupted world they’re living in. Feeling responsible and committed to what he believes in, Rama takes up the challenge. His job is to be part of this huge organisation of bad guys and destroy them from the inside. How? I don’t want to spoil the fun. You shall indulge in the visually stunning shoots and mind blowing (literally, I’m serious) fight scenes. The kerambit guy. Eh, I didn’t know there’s snow in Indonesia! 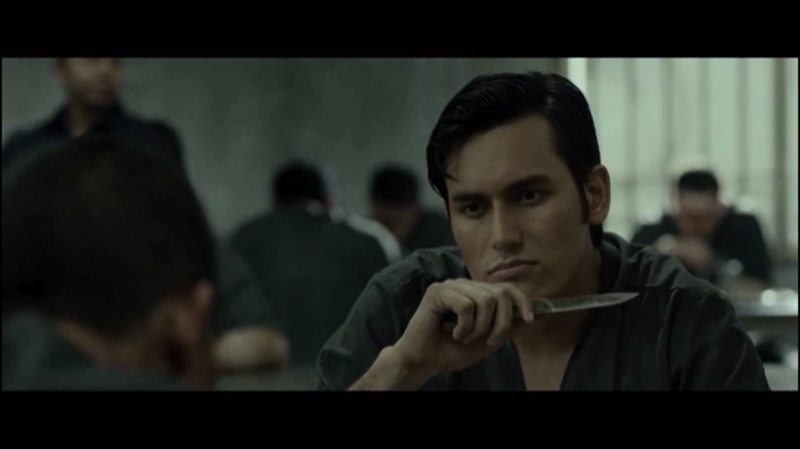 Ever since Iko’s performance in ‘Merantau’, his first film with the same director of ‘The Raid’ and this film, Gareth Evans, we can see his character and his style evolve. The boyish looks and figure has now turned into a manly man, in his gesture, in his posture, in his facial expression and physical outlook. This is perhaps due to his experience in silat. As an athlete in silat, he would surely have learned how to charm the audience. There are a couple divisions of silat in a competition. They are: a) two people fighting, and b) performing the ‘bunga’ or choreograph. In b) you need to sort of act it out, and perform it requires a performer to be charming, strong and appealing, so that the audience will be drawn in. Certainly, Iko has this experience and opportunity. His subtle gestures, his gaze, his pause, his gaze, his muscle in his scapula flex, the way he sigh and moves his eyebrow… everything is filled with emotions. The wide shot used by Gareth Evans as the opening scene is impactful. I watched this film on my computer screen and I was forced to look just at the bottom left of my screen while the other part of the screen held spectacular greenery. Have you heard of the saying, “when you put the white and the black next to each other, the black look blacker and the white look whiter”? In this case, I feel like the director intentionally ‘stained’ the greenery with a misdoing of the gangsters. I have to admit that I fancy how this film was shot. Gareth Evans (who was also credited as the writer and editor of the film) not only focused on the amazingly choreographed and realistic fight scenes, he also pays attention to simple things; in this case, the shots immensely affected the feeling of the film. There are parts when the usage of slow motion in the scene helps to heighten the mood bit by bit by bit and…bam! The fighting starts. It feels like the anticipation that horror films instill, but no, it’s an action packed film. The way of the film get marketed (“Best Action Film of The Year!”), is true to what it’s been described; if you’re an action film junkie, this is a film you should watch. The pace of this film should also be noted. From the very beginning of this film, I feel like the pace of it is at its best. The film kept me locked on the screen throughout the film and I didn’t once check my phone. The ups and down and the curve of this graph is consistent. The fighting and the intense scenes intertwine with a more relaxed scene. The roller coaster not only goes up like some action film adhere to, but this one, it goes up and downs and up and keeps you heart pounding on a healthy pace (if I may put it that way). The back story of Rama’s journey, which was initially sparked as a responsibility, turn into revenge for his brother, a motivation that is subtle yet plays an important role in drawing the audience near him. If somebody would eventually break my sister’s heart, I would definitely be mad at him; in the case of this film, Rama take it to the next level. 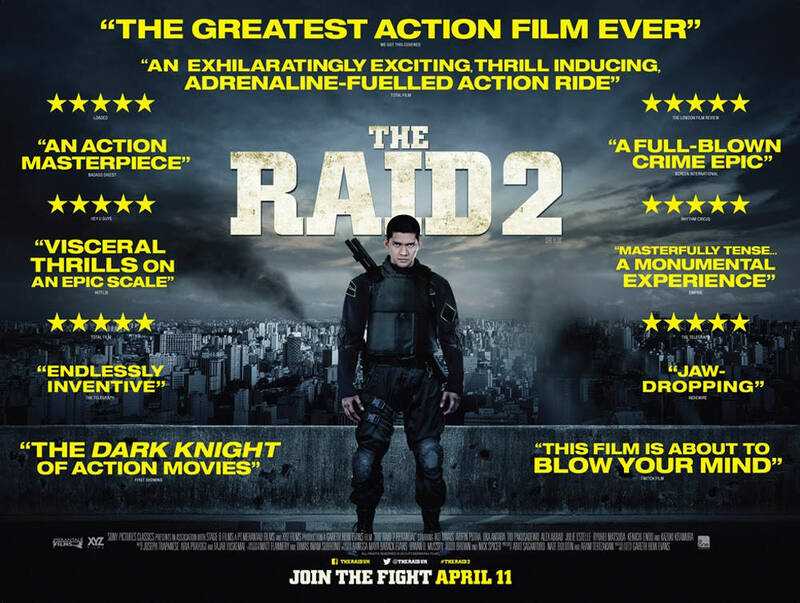 In comparing this film with ‘The Raid’, this time around you can see the budget has been increased vastly, as their shoot is not limited to a building (which you can use repetitively throughout the film, with just minor adjustments required to change the set). The setting now includes chasing cars with trailers and bikes, along with two restaurants and a prison. The list keeps going on and on, which indicate that it’s different from the first film. The plots also thicken and expand, as there are involvements of ‘sharks’ not only from Indonesia, but also from the land of the rising sun, Japan! They cast a perfect guy to play the big mobster from Japan, Goto (Kenichi Endo), who intimidate me just by doing nothing. Another thing is that they use the language of the people; they use Bahasa Indonesia and Japanese, which I admire highly because it helps to catapult the feeling and the mood of it. I feel like it not only helps to deepen the intensity but tremendously help to express the psychic of the people. (This also due to my disappointment with ‘47 Ronin’. God! That film would be perfect if they speak in Japanese!) By being local, we’re being international. This will present individuality, which in so many ways connect the audience. We’re very different in same way. We speak our own language, even when we do things our way, as corruption is everywhere. I didn’t know you can bring a knife into prison. Other than the presence of Goto, a few interesting characters have been introduced in this film. One character reminds me of some video games I used to play, where the bad guys lined up to fight you just to protect the baddest bad guy. And before I even have the chance to watch this film, a poster of a girl with two hammers has ben circulating in social media. At first I was like, “Okay, another bad guy, I mean girl”, but, after watching her in the film, I was then like, “Whoaaaaa, what a twist!” and “Jangan pandang dia sebelah mata!” A girl with hammers, how cool is that! Alongside her is this playful, psych kid with a baseball bat who at first look like he dropped out of school and is trying to make up for it by playing baseball for his country, but he turns out to be a killer. I like the twist, both young and they use both modernize weapon – I’ll explain more of this soon. Another killer, one that works for Bejo (Alex Abbad), is a slightly older man. He is portrayed as a killer that is somewhat a bit conservative, who uses kerambit, a traditional weapon, to kill his opponents. His silat skills is also impressively good which remind me of few things, specifically of some characters in the first film. What happens next will leave you shocked! I adore the director’s effort to embed the silat element in this film, through the use of its weapon, the choreography of the fight scene and in the character’s identity. At this age, I find it refreshing and fascinating to watch a film that is parallel to our time but yet instill a form of martial art that perhaps a lot of young people find obsolete and for traditionalists. Although I didn’t have the chance to learn silat (I’m a black belt in karate, though), I admire the fact that the fight is choreographed in a way that invites me to appreciate the beauty of this art, the art of silat that has been practiced way way way before. In term of the sound effect of this film, I feel engulfed by it from the first scene, with some of the parts using the natural sound, with no effect whatsoever. Just the ambiance of the setting is simple yet works proportionately to the visual. The fighting scenes, which occupied most of the film’s screen time, were filled with all the breaking, punching sound that works. It sounded very real to me and not so exaggerated (different from some of the Bollywood films, which sounds more fake then ever). In this film, the sound of each punch, kick and stab helps to heighten the cruelty and brutality of it that eventually makes the audience ache with the realness. I know that this film is from Indonesia, but if I were to compare this film with our local box office ‘KL Gangster’, I have to admit I like this film more. I think the effort that they put in to be individualistic and different is what pushed them into the international scene. I’m not sure what motivates the directors but clearly, both falls under different markets. In addition, different limitations should also be considered. ‘The Raid 2’ is certainly daring enough to be as close as possible to reality, which at a point, my eyes caught and was disturbed by a NSFW scene. But I guess it’s part of the story, to make believe and make apparent how real they want the film to be. As a conclusion, the film has absolutely matched my expectation, the fight scenes are amazing, the back story is there, the motivation is real, the characters are still in my head, and it is a beautiful film. Go watch it! A local film with a world class effort! We forget that Ezzah has a black belt in karate, so just agree with this greatest review ever written. We interviewed Ezzah on the podcast in episode 8, and she was a guest for the previous episode as well. I wrote this article after with lots of love, and I absolutely love it. Credit to Mr Fikri Jermadi for this opportunity.